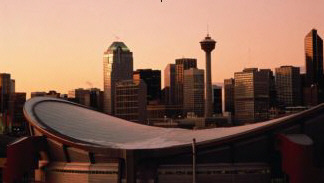 Calgary is located on the banks of the Bow River near Alberta's majestic Rocky Mountains. Calgary, Alberta attractions, include the Calgary Stampede, Glenbow Museum, Calgary Tower, Canada Olympic Park, Calgary Zoo, Heritage Park Historical Village, Spaceport, Aero Space Museum, Calaway Park, and Fort Calgary. The Calgary Stampede is Calgary's best-known visitor attraction. The Calgary Stampede is often referred to as "The Greatest Outdoor Show on Earth" features a large parade and world-class rodeo and draws more than a million visitors each year. Stampede Park also features a midway, a grandstand stage spectacular, lots of free entertainment, and interesting Western and Cowboy displays. Other Calgary Aero Space Museum exhibits include Civil aircraft engines and film. The Calgary Glenbow Museum boasts over a million artifacts and some 28,000 works of art in its vast collections and is one of the largest museums in Canada. The Glenbow Museum continues their commitment to preserve western heritage while simultaneously providing visitors with a glimpse of the world beyond. Museum exhibits feature Native culture, Western settlement, early farming, and the oil industry. Art exhibits on the second floor with a research library located on the 6th floor. Canada's largest historical village "Heritage Park" invites you to step back in time and experience Western Canada during 1864-1914. Ride a horse drawn wagon, sail on the SS Moyie, experience the early thrills of an antique midway or ride the powerful steam train. Visit the Alberta Bakery or the Old Fashioned Candy store to enjoy the treats! The staff are happy to explain the challenges and hardships faced by the Canadian pioneers who helped settle Western Canada. Calgary SpacePort is a unique education and entertainment facility focusing on space and aeronautics. The Calgary SpacePort features the latest computer, simulation and communications technology, hands-on exhibits and displays. SpacePort features a soaring aluminum prototype of NASA's space shuttle orbiter, interactive displays from the Canadian Space Agency, flight and motion simulators, a moon rock exhibit and many more exciting interactive space and aviation adventures. Calgary SpacePort is open 9 AM to 9 PM every day and admission is free. Calgary Zoo, Botanical Garden and Prehistoric Park houses over a thousand animals, including several rare and endangered species. The Prehistoric Park exhibits 22 life-size models. The outdoor botanical gardens showcase a variety of annuals, cactuses, and rainforest plants. Canada Olympic Park is the site of 1988 Calgary Olympic Winter Games events including: bobsleigh, luge, ski jumping, freestyle skiing. Guided bus tours and 90-metre ski jump tower elevations available daily. Olympic Hall of Fame and Museum features bobsleigh and ski-jump simulators. Fort Calgary Historic Park is the historical site of the 1875 North West Mounted Police fort. Fort Calgary Historic Park at the merge of the Bow and Elbow Rivers has an interpretive centre, with ongoing excavation and reconstruction of the original fort. Fort Calgary is where the settlement of Calgary began. Displays in the interpretive centre cover the life of Natives, early pioneers, and the North West Mounted Police, Canada's world-renowned Mounties, who arrived in 1875 to establish law and order. Calaway Park is Western Canada's largest outdoor family amusement park, with 23 rides. You can also catch a live rainbow trout or play a round of mini-golf. Musical productions are presented daily by the resident entertainment troupe, "Calaway Live". It also has an RV park, campground for travelers and beautiful view of the Rockies. Calgary Tower was built as a centennial project in 1967. The Calgary Tower is a navigation "center" of the city and stands 191 metres (626 ft) high and provides a 360-degree view of Calgary and Rocky Mountains to the west of the city. The Calgary Science Centre brings science to life with hands-on exhibits and unique demonstrations. The Discovery Dome is one of the best multimedia theaters in North America, with shows and wide-screen films throughout the year.